Cloudy skies. Low 47F. Winds NW at 5 to 10 mph..
Cloudy skies. Low 47F. Winds NW at 5 to 10 mph. Chance Cothren, left,a nd Gregory McCoy practice their cursive skills in Lynn Worth's third-grade class at Robert Gray Elementary School in Longview. Zandrea Raymond is working on her cursive Ps. Maybe the Qs come next in Lynn Worth's third-grade class at Robert Gray Elementary School. Halle Giles' favorite letter to write is Z. The 8-year-old gets such pleasure from crafting the letter's swooping curve and looped tail that she practices writing Zs at home. "I love writing cursive," the third-grader said last week during a penmanship lesson in Lynne Worth's classroom at Robert Gray Elementary School in Longview. "I always wanted to do it. It looked so cool." Cool-looking though cursive might be, the odds are Halle and her classmates could lose the skill by the time they're teenagers. Computers, email, text messaging and the push for a paperless society have put less of a premium on penmanship - leading some educators to question the point of teaching cursive at all. Researchers into handwriting counter with evidence that penmanship is a foundational skill in student success, pointing to studies that show cursive writing stimulates areas of the brain unaffected by keyboarding and helps children develop skills in reading, spelling, composition, memory and critical thinking. "People are really split on this, even teachers," said Rob MacGregor, superintendent of the Kelso School District. "There's not a unified voice on this subject." For now, third-grade teachers in Longview and Kelso school districts are still teaching cursive and will continue to do so as long as the districts require it. But they don't spend much time on it. "It's a time issue," said Dennis Weber, president of the Longview Teachers Union. "Teachers need too much time to prepare students for the battery of tests they're required to take." Worth's third-graders say cursive is fun and makes them feel grown up. "Cursive writing to me is a skill that's important because it is another way for children to communicate," she said. Third grade is a good time to begin because small-motor skills are becoming more developed, she said. 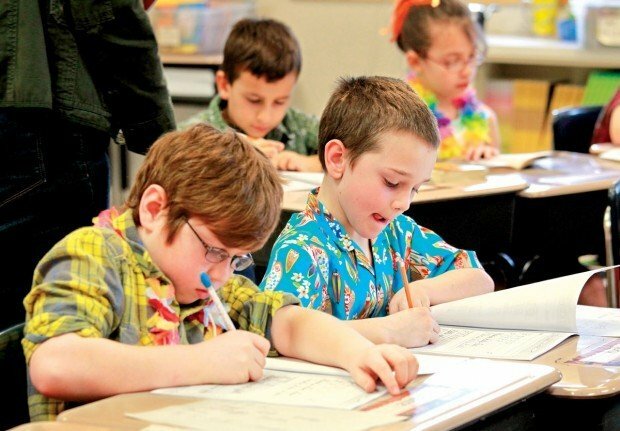 "It's almost like learning how to write in a different language," said Colin Mendenhall, 9. Hallie Earnest, 8, said, "If I hadn't learned cursive, I couldn't have read my mom and grandma's penmanship." At Butler Acres Elementary School in Kelso, teacher Lisa Graverson has seen big changes in cursive instruction in her 30 years of teaching. She introduces her second-graders to cursive lower-case letters near the end of the school year, after they have learned to print neatly. "My feeling is, cursive is kind of a lost art," Graverson said. "I kind of treat it as being art with the kids. I say it's very beautiful if you do it correctly." She works on handwriting three times a week, for 15 to 20 minutes each time. That's more than most of the teachers interviewed, but far less time than the daily penmanship drills children did when she began teaching. "It's so hard to get all the things in that we try to get in at our level," she said. "We don't have a whole lot of time to do it, which is sad." Her students will get more penmanship lessons in third grade, but after that the choice of using cursive is up to them, she said. "I hope it doesn't go away," she said. "It is beautiful." At Barnes Elementary School in North Kelso, two third-grade teachers say there's just too much emphasis placed on high scores in reading, math and science to justify spending lots of time on cursive. Jaime Mejia and Rhonda Hennessey introduce their students to cursive during the last month of school, and the kids get limited practice in fourth and fifth grade. The third-graders love it, they said. But given the choice of students using cursive or printing in schoolwork, both teachers prefer printing. "Legibility is a challenge," Hennessey said. "I personally wouldn't want to get a paper back from them in cursive." Both teachers think cursive will continue to diminish in importance. "The way things are advancing in technology, eventually (cursive) won't be there," Mejia said. "It won't be used." In the school year 2014-15, Washington will begin using the Common Core State Standards that have been adopted by the majority of states. The common standards will replace Washington's 2005 reading and writing standards, which include producing "readable printing or cursive handwriting." The CCSS doesn't mention handwriting. It's not yet known how the state will handle the issue, but the Longview School District intends to keep teaching longhand, said Dana Jones, the district's executive director of teaching and learning. "A person can't be fully literate without having the ability to write in cursive," she said. "At the very lowest level, people need to produce a signature." She noted that, without a knowledge of cursive, students wouldn't be able to read documents such as the Declaration of Indepedence. Some students, however, already have lost the ability to read cursive. Monticello Middle School instructor Gunnar Guttormsen Sr. got a shock when he began teaching six years ago. "I thought I would be able to use cursive," said Guttormsen, 60, who prides himself on his fine penmanship. "My students not only didn't use cursive themselves but they oftentimes complained they couldn't read it. I have adapted, and I print, but I wonder what the fallout's going to be with these students in the future." In reaction to the omission of handwriting from the Common Core standards, 150 educators and researchers last month gathered in Washington, D.C., for a handwriting summit. Their conclusion: Keep teaching handwriting, including cursive, because it helps children learn better. In a survey of attendees, a majority responded that handwriting should be taught from kindergarten through fifth grade, with 95 percent believing that both cursive and manuscript should be taught. One of the speakers, Dr. Karin James of Indiana University, explained her research clearly showed a link to children writing by hand and the brain activity it sparks that support the development of literacy. Another speaker, neuropsychologist Dr. Virginia Berninger of the University of Washington, has done research studies on writing's affect on composition for 20 years. She told The Daily News that brain scans have shown that cursive writing taps into a different area of the brain than printing or keyboarding. Writing in cursive seems to help the brain with self-regulation and mental organization, she said. "Cursive helps you connect things," she said. "There really can be some advantages to cursive. We found individual differences whether children had skills for each kind of writing." Berninger said she was unprepared for the passionate opinions people have on cursive writing. "We found in our work that handwriting's important," she said. "But I'm unprepared for all this emotionality. I'm more interested in how we use writing to capture ideas." • Cursive writing evolved from the Italic calligraphy hand. 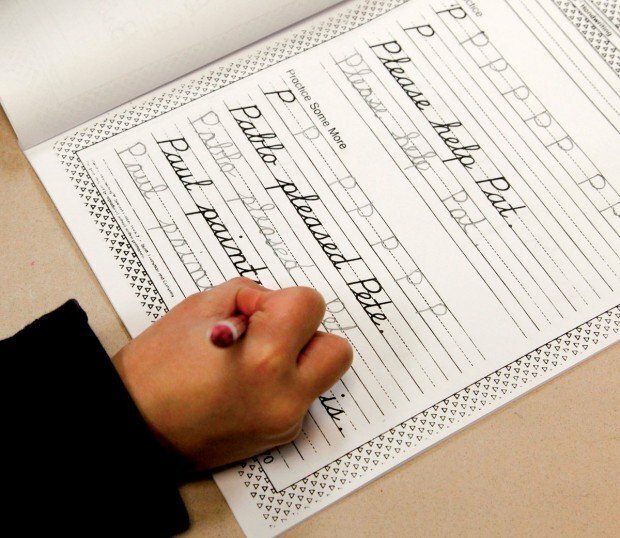 Should schools continue to teach kids cursive?